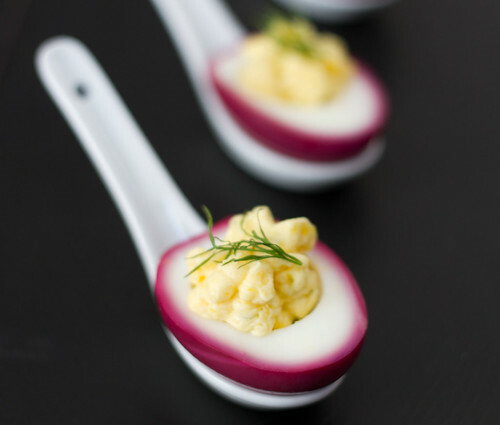 Yet it had never occurred to me to make deviled beet eggs until I came across this post on The Kitchn (well, I actually first spotted the recipe on Pinterest, where I promptly pinned this to my Beautiful Beet Recipes board). I had to make them. First you need to hard-boil some eggs. There are several "schools" of boiling eggs, but here's what I do. Place the required number of eggs in a single layer in your saucepan. Pour over boiling water to cover. Set the timer at 8 minutes (I use large eggs, 7 is enough for smaller eggs) and simmer over moderate heat. Once the timer goes off, rinse the eggs under a cold running water for a few minutes to cool them down. Note that you don't want to overcook your eggs, as this results in those unsightly green-blue rings around the egg yolk, caused by sulphur compounds. You can avoid those by not overcooking your eggs in the first place and quickly cooling them down in cold water after cooking. When cool enough to handle, peel the eggs carefully. Place in a single layer in a bowl, pour over the beetroot juice, season with a bit of salt. Cover, place into the fridge and leave to marinate for about 3 hours. (Longer, if you want, but I wanted just a thin ruby-red beetroot effect this time). 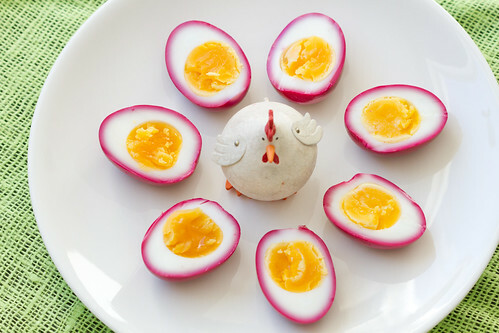 If you wish, you can serve the eggs just like this, halved - look at that gorgeous yellow yolk! I cut off a thin slice from the base of each egg half - this way they sit neatly on the plate and don't slide all over the place or fall over. Hey, I still have that chicken! 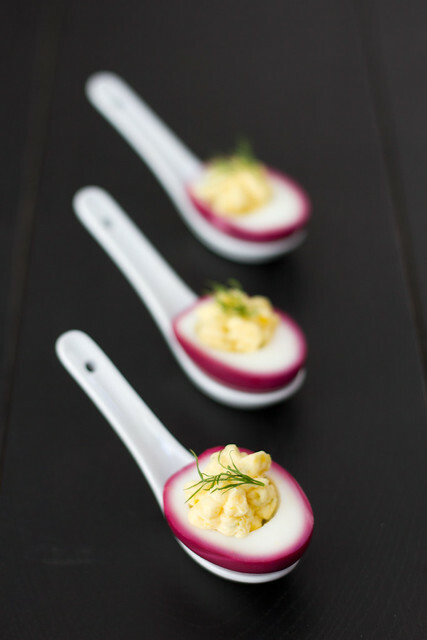 If you want to make devilled beetroot eggs, then halve the eggs and gently scoop out the egg yolks. 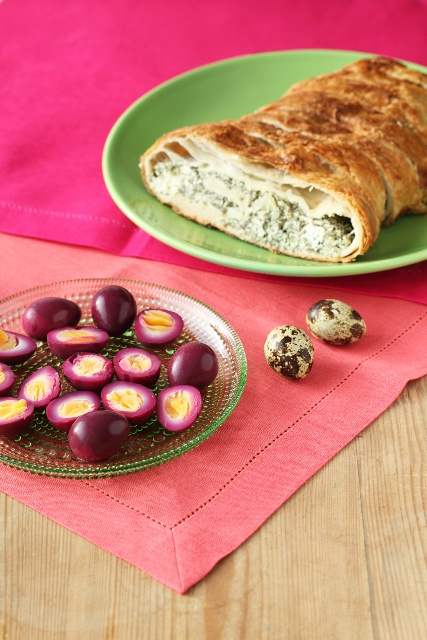 Make your favourite devilled egg mixture. My regular "Estonian deviled eggs" include some mustard, butter and mayonnaise. However, knowing the affinity of beets and horseradish, I used egg yolks, butter, mayonnaise, some strong horseradish and finely chopped dill for the filling. Worked like a treat! To be more precise, then that's what I did. Mash the egg yolks and butter (I grate the butter and egg yolks finely, but you can also press them both through a sieve). Stir in the mayonnaise and season with salt and horseradish. Mix in the dill. Spoon onto the egg halves or use an icing bag with a serrated tip and fill the eggs. Enjoy! You can make these a few hours in advance, but keep them in the fridge until serving then. I like to make marbled eggs and I use red wine for that - it also gives a lovely result. Nice photo. I have so many eggs and was thinking about pickled beets that I had seen in grocery store. Now you inspired me to do something with eggs. Thank you.